June is considered the month for weddings, so what better way to celebrate that than to have four ladies who write historical romance and are experts at love tell their own wedding stories! Maya Rodale penned the popular Writing Girl Series and makes her home in New York City. Miranda Neville is in the midst of a new series, the Wild Quartet, and lives in beautiful rural Vermont. Caroline Linden's upcoming book, Love and Other Scandals (August), is already garnering rave reviews! Caroline lives with her family near Boston. 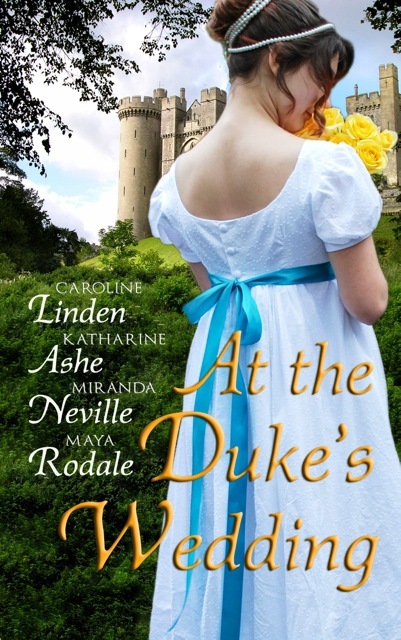 Katharine Ashe starts a new series in September with the upcoming, I Married the Duke. Katharine resides in the wonderfully warm Southeast. Please welcome Maya, Miranda, Caroline, and Katharine! Last year the four of us wrote short stories for a free promotion piece (Once Upon a Ballroom) and had a wonderful time. So wonderful that we had to do it again, this time on a larger scale. Brainstorming for a June release, naturally we thought of weddings. One wedding, at an English ducal estate 1813. But with four different heroes and heroines meeting, quarreling and reaching Happy Ever After during a two-week-long house party, ending up with four weddings, none of them expected. Each of us plotted her own novella, but we came up with a number of common threads and characters that appear in all our stories, notably the White Muslin Crew of Regency girls running wild, the wisecracking Lady Sophronia, and Hippolyta, the world’s greatest high perch phaeton. And then there was the timeline. Emails flew through cyberspace: “Can we have a cricket match on Day 7?” “Is it OK if your guy and mine meet in the stables on the morning of Day 10?” And gales of virtual laughter as we wrote little scenes for each other’s characters. We hope AT THE DUKE’S WEDDING will bring readers as much pleasure. Descriptions of the four novellas may be found at http://www.atthedukeswedding.com. We’d like to share some of our own wedding stories and pictures. Maya: The bride and groom wore cowboy boots--even though he's a Brit! My sister the bridesmaid, who may or may not be taller than me, was forced to wear flats. But hey, it was my day! My perfect, lovely, totally romantic day. Miranda: I was married in June in the English countryside but not at a ducal mansion. The reception was in the garden of my parents’ house. I wish I could tell you about the food and decorations but the details vanished into a blissful haze. I was attended by my five-year-old niece. As you can see by the “before and after” picture, her toilette deteriorated in the course of the day. 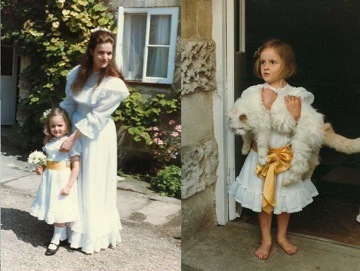 The yellow satin sash was one I’d worn as a flower girl at the same age (my mother never threw anything away) and the elderly male cat was named Cleopatra. Caroline: Here's a candid photo of me, getting photobombed by an irate junior usher! He was about 6 and wildly annoyed by all the photos being taken, when we could have been doing something much more important like getting to the food. My favorite comment on the ceremony was from my younger sister, who was a flower girl: "It was like going to church, but short and not boring." Katharine: Right before we all went off to the church, my parents' house was full of crazily busy people: me and my sisters dressing, the stylist coiffing, the photographer grabbing us all for pictures, caterers running between the kitchen and the tent out back where the reception was to be held, and little nieces and nephews scampering through it all. And it was pouring rain: lovely, wet, steamy June in Pennsylvania. That's when our French baker called. In a torrent of irate Gallic syllables he lambasted the florist. She had apparently informed him that she would decorate the cake with fresh flowers (as planned) at our house rather than at the bakery where he could supervise. The florist (a truly amazing artist) thought he was a pipsqueak. Fifteen minutes before the ceremony, the baker refused to deliver the cake. Then someone summoned my husband. Fluent not only in the French language but also in the character of certain Frenchmen, he grasped the phone with confidence. First he told the baker that his cake was sans doute the most important part of the entire wedding. Then he agreed that the florist's demand was thoroughly outrageous. Finally he promised the baker that should anything happen to the cake other than the greatest artistry, he would hold himself personally accountable and write a condemnation of the florist and a formal apology to the baker. By the time my husband hung up, he and the baker were best friends. My hero. 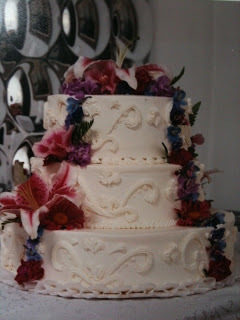 The cake was delicious–and beautiful, as you can see in the picture. I used the baker as the model for the French baker in my novella HOW TO MARRY A HIGHLANDER (coming July 30). Please share your favorite wedding story, from your own or any other wedding. We have prizes for three commenters: a complete set of Caroline Linden’s Bow Street Agent trilogy (A View to A Kiss, For Your Arms Only, and You Only Love Twice); Miranda Neville’s The Importance of Being Wicked, plus the prequel novella The Second Seduction of a Lady; a digital download of Maya Rodales’s Seducing Mr. Knightly. (We forgot to ask Katharine about a prize before she left on vacation WITH NO INTERNET.) Sorry, US addresses only. Handsome, inarticulate Frank Newnham asks his cousin Christian's help when he woos Rosanne Lacy by letter. Rosanne falls for Frank's delicious prose, but when they meet in person at the duke's wedding party, Rosanne can't understand why Frank seems so ... dull. And why is she drawn to the dark brooding Earl of Bruton, with his scarred face and air of melancholy? One of my favorites is my cousin's wedding in Vegas. I like that it wasn't super fancy. There was no formal dinner. We ate at the Bellagio buffet. I've never been to Vegas. Something to look forward to, and a wedding would be awesome! I like wedding related stories! Usually such a happy, eventful, chaotic time! We had a man sing during our church ceremony. He had such a beautiful voice it brought tears to my eyes! I received more compliments on the singer than anything else. The band that played at our reception was the absolute worst. No chance in tempo..the WHOLE night! What a perfect way to describe a wedding, Laurie--a happy, eventful, chaotic time! I love the music at weddings, Laurie. A great singer has brought me to tears more than once. I keep hoping one of my friends will decide to get married in Vegas, or better yet, Aruba! We've been twice, and every single time there is at least one wedding while we're there. On the beach. At sunset. Simply gorgeous. I just got home from Hawaii, Caroline. While there, we saw three weddings at the beach with two of the wedding couples in traditional Hawaiian dress. It was lovely! I think my favorite memory from my wedding is dancing with my dad. I always danced with my dad as a kid and I stood on his feet. It was such a great moment that I cried the whole time we danced. The warmth, beauty and memorable evening surpassed everyone's expectations. A small but beautiful wedding. When we couldn't get a hold of the Inn the morning of my wedding, we didn't worry. When they still didn't answer the phone two hours before the ceremony, my mother started to sweat. When we got there and realized the entire Inn was out of power due to the overnight thunderstorm and they were cooking in the dark (no windows in the kitchen!) we were a little dazed. 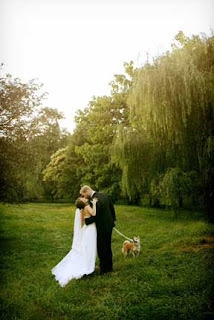 No worries--ceremony was outside on a gorgeously crisp, sunny, washed-clean fall day. We put some of the hundreds of candles purchased for the reception tables in the bathrooms and shared some with the kitchen. Asked the harpist to stay on and play for cocktail hour and into the reception if we didn't get power back for the DJ. And we had the BEST wedding ever. None of the guests were the wiser about the power outage (except for those who asked for coffee--although you can cook on a gas stove, coffee pots don't work without electricity!) and we got TONS of compliments on all the lit candles. Power came back on just in time for dancing. It's wonderful that the accident of bad weather ended up making the occasion even more magical. Kudos to the inn for dealing! How wonderful that you were able to take a bad situation and turn it into a beautiful wedding memory, not just for you but for everyone who attended! p.s. Thanks to all the ladies for a thoroughly enjoyable wedding romp! Half-way through At The Duke's Wedding and loving it. The fact that you all had so much fun creating it makes it all the better. I haven't read that one yet, jcp. Thanks for telling us about it! I love seeing all the wedding pics, ladies. 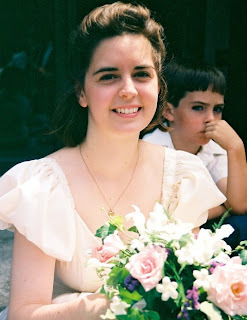 My most memorable wedding experience occurred at my sister's wedding when her veil caught on fire. I was her maid of honor and could only stand there, my arms full of flowers (mine and the bride's) and stare in horror. Fortunately, she managed to extinguish the fire with a little help from our uncle who was performing the ceremony, although the observation that she should have seen that as an omen has been made since by several people. A more pleasant memory is the wedding of a young cousin several years go and the raised eyebrows of our town's oh-so-proper matrons at the reception when the menu included the bride's favorite food--fried green tomatoes. Oh my goodness, Janga! That is definitely a memorable wedding scene. And good for your cousin--I love fried green tomatoes! I would love to read this book and have added it to my TBR list! I really can't think of a wedding story that I would like to share at this time. I will say though that I used to wonder why women cried at weddings... I don't any more! LOL I do love them. I was invited to a friend's wedding on a very hot day in the summer. The church had no air conditioning and the bride fainted at the altar. It made for a memorable ceremony. I've been to a few of those where I expected people to faint. Thankfully, they didn't but it sure would have made things memorable! lol! I too had a wedding in June in PA (it will be 44 yrs. on the 21st). My husband was late to the wedding. We had just bought a new English sportscar (his choosing lol) and the last thing I had told him the night before was don't forget to get gas. (so you know what's coming). So there he was with his best man, dressed in their tuxes, pushing the car to a gas station. He thought the car had just broken down. The attendant tells him that he knows nothing about foreign cars. Luckily, an angel was standing by in disguise as a little kid who said, "hey, mister - does it have gas?" So eventually he walks into the church and in his booming voice, proceeds to tell his mother and the whole church, that he ran out of gas. So I walked down the aisle to laughter all around and relief that he was safe and I wasn't jilted lol. On our first date he did and that's why the reminder lol. And you're right, it's never happened since lol. Love the sound of AT THE DUKE'S WEDDING. I'm looking forward to reading this one. Also enjoyed getting a peek into each of your weddings. And what lovely photos! I love to read about weddings, the clothes, the happiness, the happily ever after. I haven't been to very many. My sister and I wore the same wedding dress 3 years apart it rained both times at the same venue!! My marriage has lasted 20 years this October and hers lasted well many years less. My brother's DJ made a video montage of his & his wife's childhood photos. It was very touching. They were in their late 30's, so those old photos were old! Black & white! Don't really have any memorable wedding stories... mainly cuz I don't really enjoy them and only go when I have too :) My cousins traumatized me... I'm the youngest in the extended family and by the time I was 16, I had been forced to participate in at least 10? weddings. The last one, I went to the dress fitting w/ another cousin (who was 15) and her 6 yr old sister who was the flower girl. When we came out of the dressing room, we were all wearing the same dress!!! I was sooo mad. And to add insult to injury my aunt made us wear a giant, homemade hair clip, with bows and flowers. The pics are kinda funny cuz I'm scowling in every one! I really like the idea of ATDW! I can't wait to read it! One mishap, that turned out well, was at my wedding. My mother and mother-in-law-to-be were to walk up to the altar to light the parent candles after they were seated by my husband-to-be. However, they forgot. So, Jerry walked back down to the front of the church, held out an arm to each mother, and escorted them up to the altar. It looked like part of the plan. The other wasn't a mishap, but a surprise for my husband. Our song is "The Rest of Mine" by Trace Adkins. We played the tape at the rehearsal, but, what my husband didn't know was that I had recorded it 3 days before the wedding and my version of the song was played during the candle lighting ceremony. He leaned over and said, "That's....that's not Trace Adkins; that's you!" He then began to cry and I wiped the tears from his face. Now I'm wiping the tears from my face! My parents had both passed away a year before I got married so we chose to get married in my hubby's family church. He's 6'10" tall and I'm only 5'2" so when it came time to kiss the bride, I had the best man place a step stool in front of me so I could climb up and save his neck. LOL We had our 22nd anniversary this past Friday. Also, I found out later that my hubby and his immediate family had had an interesting morning. Apparently sometime before dawn a squirrel had bitten through the power line to their house so obviously their alarms didn't go off. By the time they realized what time it was there was a mad scramble to get ready and to the church on time. I was at a hotel and had no idea. The band we wanted was booked for our wedding day so we took their advice and booked the band they recommended; they said that the other band was "just like them." We made a gigantic mistake when we hired this other group without going to hear them first! I got the band straight out of "My Big Fat Greek Wedding!' We've been married 35 years and people still talk about the music!